A growing number of states are running out of cash to pay unemployment benefits, a sign of how far social-welfare systems are being stretched by the swelling ranks of the jobless in the deteriorating U.S. economy. Unemployment filings have soared so high in recent months that seven states have already emptied their unemployment-insurance trust funds, which were supposed to see them through recessionary periods. Another 11 states are in jeopardy of depleting reserves by year's end, according to the National Conference of State Legislatures, which published a January report entitled "The Crisis in State Unemployment Trust Funds." Unemployment isn't much of a help but it is something and without it I don't see what the unemployed would do with no lifeline to help them through a very dry period in their careers. So many things are running out of money it makes you wonder just where has all the money gone to? 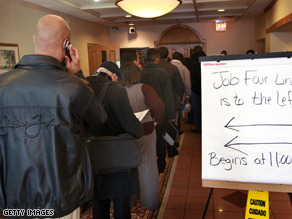 It is sad to me as a multiple business owner when someone mentions to me "unemployment benefits". I recently bought a business where the previous owner, after closing, filed for unemployment and received benefits. This, in turn, cost me more money by being forced to contribute to my experience account. I also had another employee that quit and quickly found another job that payed cash. She, too, collected unemployment at all taxpayers expense. The examples above are what I consider shameless oversights that have been taking place for years. People lying to receive benefits and people allowing it to happen. And people question why small business owners aren't hiring people. Why would I? I realize the scope of our economic crisis in America is far beyond these examples, however, perhaps the underlying message in it all is this: we are spoiled and consider only ourselves far too often....and we almost think we are "owed" something.